There were no victims in Sunday's blaze, which consumed part of the Velodrome's roof and track; Brazil's Sports Minister blames unmanned hot-air balloon. RIO DE JANEIRO, BRAZIL – Early Sunday morning, July 30th, just a few days short of the one-year anniversary of the opening of the Rio 2016 Games (August 5th), a raging fire consumed part of the cycling track and roof of one of the Games’ main venues, the Velodrome in Rio’s Olympic Park in Barra da Tijuca. It took Rio fire fighters several hours to fully extinguish the fire at the Velodrome, allegedly caused by a hot-air balloon, photo internet reproduction. It took Rio fire fighters several hours to fully extinguish the blaze which began around 12:30 AM. After the incident, Brazil’s Minister of Sports, Leonardo Picciani, released a statement indicating that the fire had been caused by an illegal unmanned hot-air balloon that collided with the stadium roof. “The Ministry of Sport deeply regrets the incident this morning at the Velodrome Park and at the same time criticizes this criminal practice of releasing balloons,” said the Minister’s statement. Launching unmanned hot-air balloons or lanterns has been a long-held tradition in Rio, often connected with religious celebrations. But, due to the flammable nature of these devices, they were outlawed in 1998. The Olympic Legacy Governance Authority (AGLO), the governing body responsible for managing many of the Rio 2016 sites, also released a statement on Sunday repudiating the hot-air balloons and asserting that the Velodrome would be rebuilt. 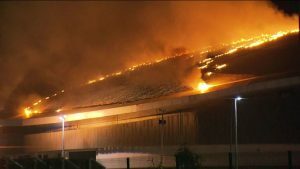 The Velodrome’s track, made of a special Siberian pine wood, was severely damaged in Sunday’s fire, photo internet reproduction. “The practice of releasing balloons is an environmental crime and, therefore, [AGLO] rejects the initiative. It is expected that after expert analysis, those involved will be properly punished for destroying public property. We also point out that we will take all necessary measures for the Velodrome to be quickly recovered and returned to full operation,” the statement said. The Velodrome hosted track cycling events during both the Rio Olympic and Paralympic Games. The track, considered one of the fastest in the world, was built with a special pine wood found only in Siberia. Construction of the venue was besieged with delays. It was not until June 26, 2016, only a month before the opening ceremony, that the Velodrome was officially inaugurated by then-Rio Mayor Eduardo Paes. 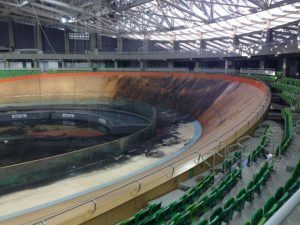 Like many of the Rio 2016 venues, the Velodrome was not used for months after the Games ended in September and only hosted its first post-Olympic event in May, the three-day bike festival, Rio Bike Fest.